after a long day at work i come home to find the case of Frostwings that ive been waiting on, sitting on the kitchen table. Twenty minutes later, and 12 kickers later, here's the damage. Been holding off on a case for a bit really. just couldnt quite swing it in the budget the last bit. That being said, i decided to splurge this time, since next month im going to have another major hobby purchase happen. As for Dragon Dice™, wonderful product BTW, I had to squeeze one in there somewhere. Ill most likely get another case soon enough too. Perhaps a second of Frostwings. I was really hoping for a Magi, but alas... not one to be seen. An odd thing of note though... i opened a kicker which contained 5 Commons and only 1 Uncommon. Has anyone else ever seen this happen before? I guess though i cant complain. The first kicker i opened had a Frost Ogre. Cliff said it was the luckiest case pull he'd ever seen. still chasing the mythical beast ddicer? An odd thing of note though... i opened a kicker which contained 5 Commons and only 1 Uncommon. Has anyone else ever seen this happen before? Yup Cliff. No worries on that. I'm thankfully glad I did get the Frost Ogre, even if I didn't get a Magi. I know they are basically both the same rarity, and honestly went in, when I started opening, expecting neither. My frost wings race split is most likely going to be 8-4-2-1, so since I needed 2 I was hoping I might get a magi out if the way first. But it's all good. Other than the odd uncommon/common swap I'm pretty satisfied with it. Based on your previous note that might be an issue for you. I'm expecting to be able to mail out both the scalders and the new amazons around the first week of June (It's a slow boat). I might even put up a pre-order for scalders if you want to get them as fast as you can! Pax East is just a very lucky place to buy dice, everyone should come here next year! Last year, my budget was really tight, bought 2 kickers yielding a Behemoth and a Troll. A bit more funds this year (but Kickstarter had just eaten my gaming budget with Forgotten King), 4 kickers with 2 Gargoyles, Cannibal, and Drider; and 2 Amazon/Swampy Starters with a Centaur. And all the packs did very well for filling in shortages to balance out my assortment of all sizes of D6's too. Ah, thanks for giving me the heads up Cliff. Amazons i figured id probably get a case of on release, just for the chance of chasing an Inferno and some Faeries. Though, if you figure that Scalders are going to go back up at about the same time that the Amazon kickers go live... than i think that ill perhaps hold off on the amazons for the first small bit and try my rediculiously bad luck at a race that i have no dice for yet. Dont worry about the preorder, ill take care of it when i can. As for that though, if i did, when would i get charged on my card for it. Immediately or when they would be ready to ship? Either way, thanks for the heads up. I was going to ask if there was some type of ETA at some point soon. Have to take care of a large Deadpool order for Heroclix, that i preordered back in october. But when that's clear and before the boat shows up, ill make sure you get a fat stack of bills. if i did, when would i get charged on my card for it. Immediately or when they would be ready to ship? Because we use Paypal, they would charge it immediately. They don't technically allow for pre-orders. They like you to ship the product immediately, but doing it this way allows us to get the right number of people and boxes ready for the day the pallets arrive on our stoop. Also had one Battle Chest in there. At least I know I got closer to the predicted odds in that one, right? At least I know I got closer to the predicted odds in that one, right? I wouldn't say that. You pretty much nailed the predicted odds with the Scalders/Frostwings pulls! Got my box of scalder kickers today, pulled 2 Unseelie Faerie but no Inferno. 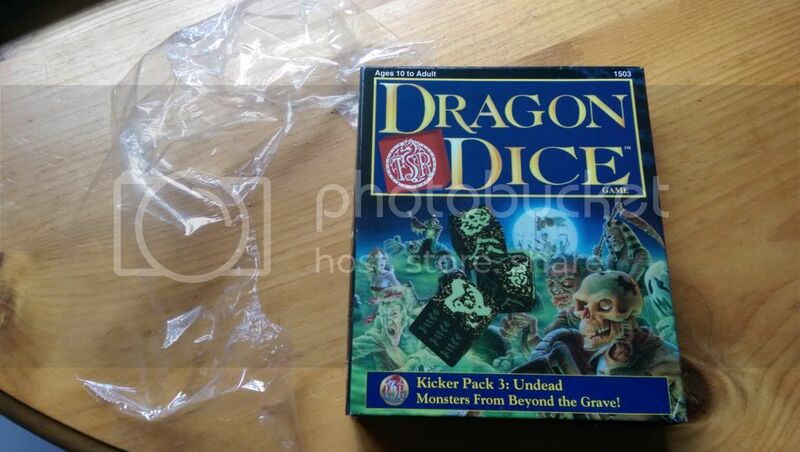 Recently found a sealed TSR Undead kicker on eBay and couldn't resist. When I opened it I was pleasantly surprised to find a Dracolich! To think, whoever had this sealed kicker all these years had no idea what lurked within! 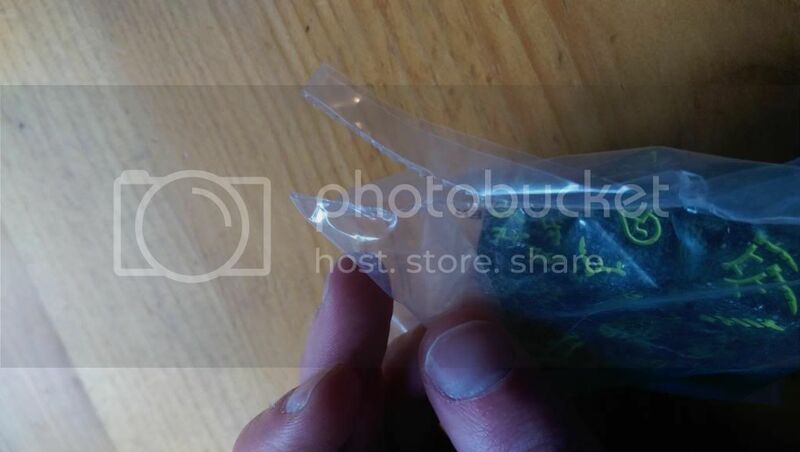 Pictures: the bag looks like it's ripped open but it's just over-sealed and has split along the seal. Paulvonscott can verify this pull! Opened it in his excellent store Midlam Miniatures in North East England. I grabbed four Kicker Packs as I eased myself back into Dragon Dice™, two of which were Amazons. In my collection I had exactly 3 Amazon dice (1 Harbinger, 1 Seer and 1 Charioteer - all obtained in a TSR-era Monsters & Amazons Kicker Pack). 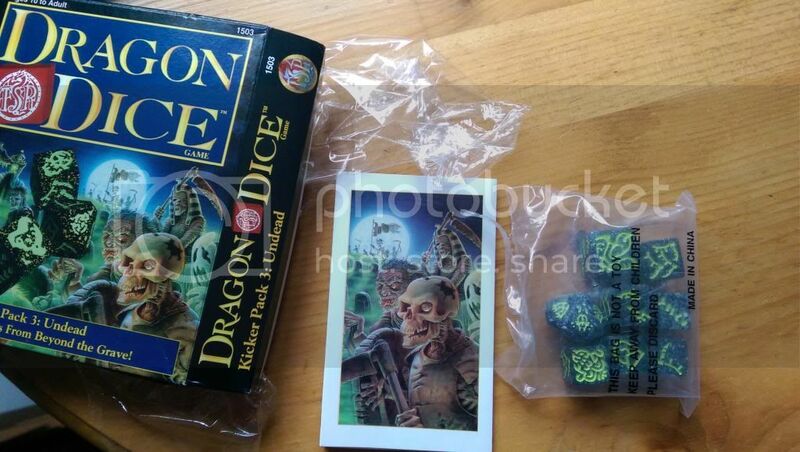 The first SFR-era Amazon Kicker I opened was the first pack of Dragon Dice™ I've opened since 1996 - so it's been quite a while! That was pretty exciting to get the new 5th monster! I bought a Case of Amazons, and 2 Kickers of Scalders. I got really Lucky pulls by the 5th Monsters, but thats the Best of all.. 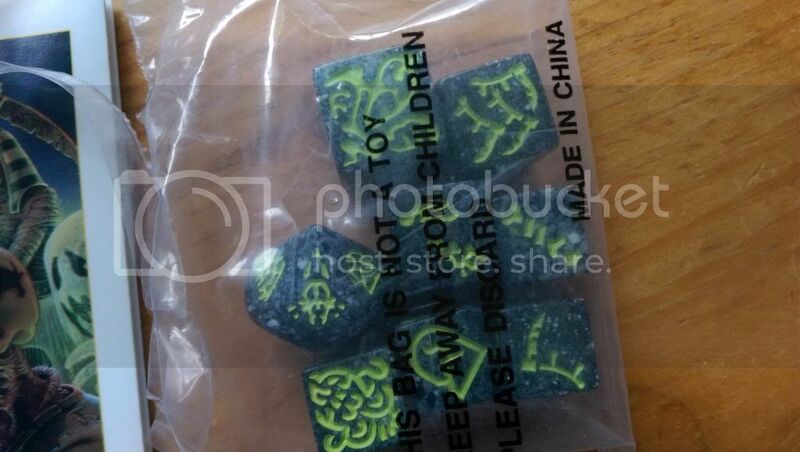 The Distributor Lion Rampart Imports, here in Canada, has possibly restocked some of their Dragon Dice™ products. I figured that if i left several kickers sitting on backorder for a while they might actually do something about it. Anyway, was 3 kickers each of Dwarves and Goblins. They dont have many of the races listed at all, and still list the discontinued starters. I actually needed the Umber Hulk, and the Cannibal was a great pull. Hopefuly this means that they've restocked some, and any canadian who may need a dice fix can talk to their local store about doing an order soon enough. The Amazon Kickers just arrived at my FLGS, Pandemonium. I'd pre-ordered 6 kickers to see how my pulls went before buying more. Got the 6 boxes I really wanted! 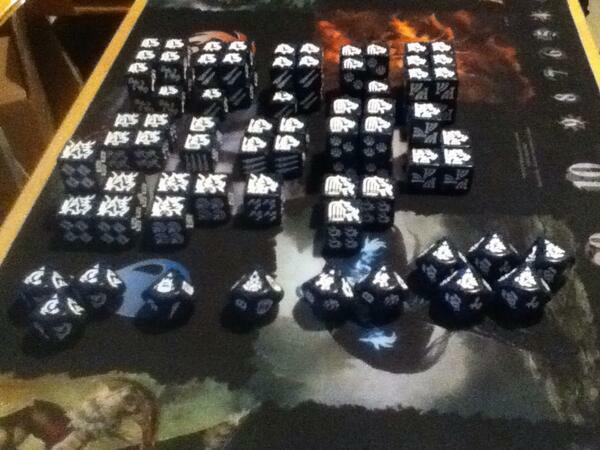 For dice I was particularly looking for, pulled 1 Nightmare, 2 Wardrivers, 1 Harbinger, and 2 Spearers. Previously, out of 9 rares, I only had 1 each of the Wardriver and Harbinger (and those were both late acquisitions!). My bell curve on buying Amazon Starter has been harsh. Previously had 3 Spearers, but it's alway nice to have those for Reserve artillery fire, or for the Home Tower. Just received the case of Treefolk I ordered. Pulled a Phoenix from my first Firewalker Kicker ever. Didn't even know it was a fairly rare die until I started looking around here.